The Leszek Blanik Gym Hall Innovation and Implementation Centre at the Gdansk University of Physical Education and Sport has seen specialist resin systems from Flowcrete installed. 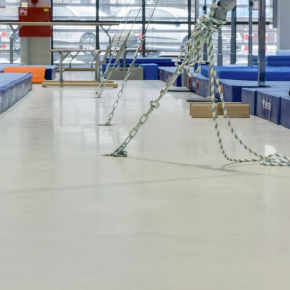 The facility, which is the most state-of-the-art gymnastics centre in Poland, features close to 2,100 square metres of specialist resin systems from Flowcrete, ensuring the floors throughout the site provide users with high performance, long lasting surfaces. The centre is an investment project made at the highest, world-class level of gymnastics – it hosts the AZS AWFiS Leszek Blanik Academy – a project to promote and develop gymnastics and acrobatics among all age groups. The training team consists of experienced trainers and one of its coordinators is Leszek Blanik, Olympic Champion from Beijing in 2008 and coach of Poland’s male gymnastics team. The main gym hall saw the application of a seamless Flowshield LXP resin floor in a light grey colour, with a blend of blue additives in carefully selected, delicate shades. 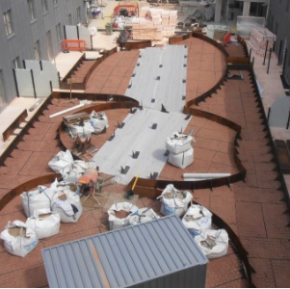 Flowshield LXP is a smooth and flexible floor, which is made using coloured polyurethane resin. 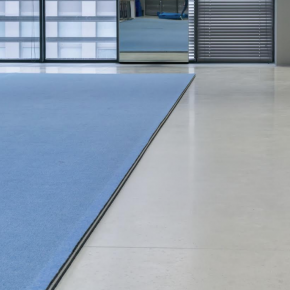 High abrasion resistance of this system makes it ideal for areas with lots of footfall and especially where the floor will be subjected to impacts, scuffs, scrapes and wear on a daily basis. 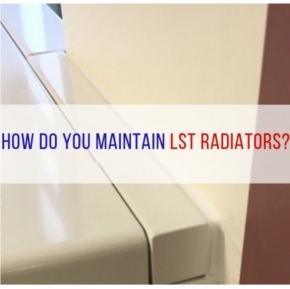 The seamless and impervious nature of Flowshield LXP means it is very easy to keep clean, helping to maintain a high standard of hygiene. 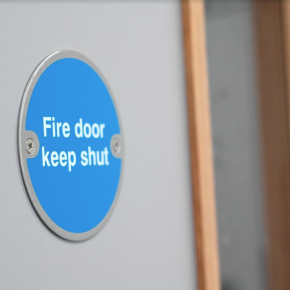 Cleanliness is of particular importance in locations such as this, where intensive physical training takes place. Fine, colourful particles were incorporated into the floor to give it a decorative, dappled character, creating a subtle background for the mattresses and other training equipment arranged across it. Olgierd Bojke, Chancellor of Gdansk University of Physical Education and Sport, commented: “The main gym hall in our facility has a height of 12 metres and on three sides has access to natural sunlight, which ensures optimal conditions for training. 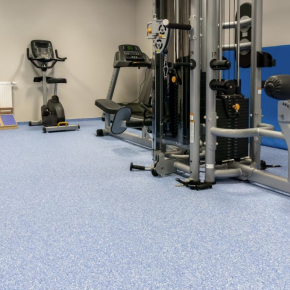 In addition to the main gym hall, resin floors with eye-catching flakes were also utilised in smaller rooms throughout the facility, including an area designed for strength training. 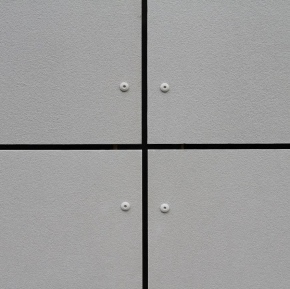 The company responsible for the flooring application was the contractor Invest Group Sp. z o.o.